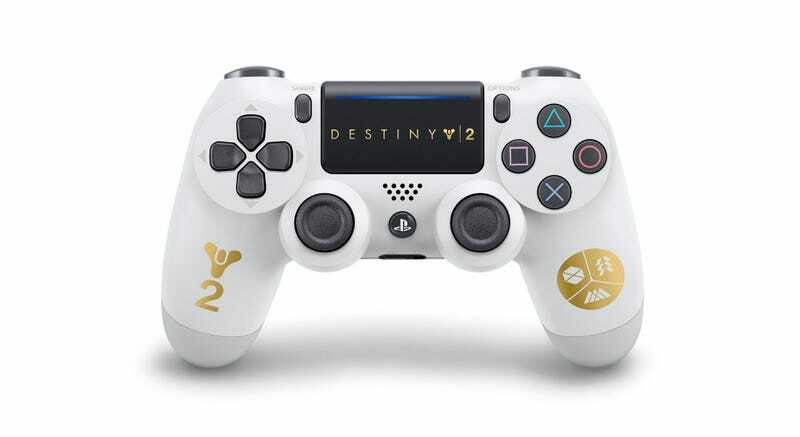 The Dualshock 4 will feature a touch pad customised with the game’s logo, plus the iconic character class insignia, all in striking gold – making it the perfect companion for your next raid! It is literally the existing white DualShock 4 with some logos stuck on it in dumb, obvious places. You can’t even make fun of the design here, because there is none. This looks like an intern opened a folder, dragged three images into Photoshop then clocked off for the day. It looks like a Kotaku ‘Shop contest entry. It looks like something I’d have bought in a Mad Catz sale in 2002. It looks like something that would be called “Great Destiny II DuelShake Four4" on a dodgy Chinese auction site. As someone who’s deeply in love with Destiny’s look, it’s a shame this is so hilariously bad. The first Destiny had one of the prettiest custom PlayStation designs in history. Oh well! We can always not buy one.